American River College hosted a College Hour on Thursday featuring a panel of students from Disabled Students Programs and Services (DSPS) to talk to other students about the struggles they have faced in their lives. DSPS is a program on campus for disabled students. 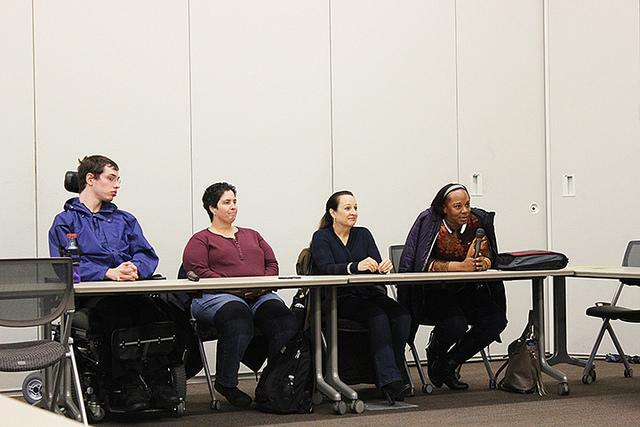 Panelists said that disabled students often have challenges that aren’t readily apparent to others, such as feeling judged for taking the elevator instead of the stairs. DSPS sign language interpreter Rene Flores-Jewell was diagnosed with a kidney disease at age 15. She had to get a kidney transplant when she was 30 after she had a stroke. Last year, she got diagnosed with stage three uterine cancer. Flores-Jewell spent five years isolated from the public after her stroke. She would go to work, get food and come home. “You look at me and people think I’m all happy but it’s a constant struggle everyday to get out of bed,” Flores-Jewell said. ARC student Rene Bisnett has been through five surgeries on her wrist and knee and she is fighting to have a partial knee replacement. “People have looked at me getting out of my car when I have my handicap license plate and I have got many dirty looks and some people have even said something to me but no one has ever asked why,” Bisnett said. ARC student Michele Gobern has dyslexia, which makes it hard for her to read and spell. Gobern has little kids and when they were learning to spell words, she was also learning with them. She decided to sign up for DSPS for the help and thinks it was the best thing for her to do. Be the first to comment on "Challenges for DSPS students discussed at College Hour"